Early in my career I worked in the hospitality industry, including a stint at Marriott’s Rancho Las Palmas Resort in Rancho Mirage, CA. While there I had a chance to work with Robert Small, a passionate general manager with a vision for the resort. His goal? To earn a coveted Mobil Travel Guide Five Star rating. However, getting that fifth star is tough. It requires perfection. Conceptually, the resort was not designed to be anything grand—simply a nice hotel in a part of the country frequented by visitors seeking the warm, dry, desert air. Bob took on this project with a very different vision for Rancho Las Palmas than just being a nice hotel in the desert. He saw Mobil Travel Guide’s Five Stars. He saw potential for a great resort, beautiful grounds, top notch people, and success in occupancy and revenue rates. And he knew how to get there. It was about vision, focus, and—most importantly—service through people. So, how did he do it? People: Bob knew everyone—Annie who ran the laundry, Freddie the bellman, Eddie the landscaper, and every other person who worked there. He knew what made them happy and sad, and what made them tick. He also made sure they had The Vision. He talked about it on a personal level to everyone, every day. Every employee wore a gold star lapel pin, which represented the fifth star we were working toward. He taught people; he led by example; and he liked people. And they knew it. Competence: Bob really knew his stuff. He knew quality meats and the best produce. We didn’t talk about that as much in the 80s as we do today—but he did. He would even go up against Marriott’s buying practices—not that they were bad—if he thought he could make a better choice. For example, he had the notion that if the hotel grounds had citrus trees throughout, it would make a huge difference. There would be blossoms in the spring and glorious fruit through the winter. He didn’t imagine that anyone wouldn’t agree with him—so he asked the landscape manager to plan and order the trees. In the meantime, he sent a request to corporate to get the expense approved. The very day the trees arrived, the “request denied” paperwork arrived at Rancho Las Palmas. What did Bob do? He planted the trees. How did he get away with that? Because average rates were higher than expected and occupancies were higher than expected—the things he knew, and did, worked! He was competent at his role and committed to the goal. Heart: Bob’s weekly staff meetings were legendary. He read aloud from letters from our guests, which were always praising employees. He talked about The Vision—yes, every week. He highlighted successes, large and small, and talked about employees who stood out to him and why. He made it personal. He respected competence in the staff members and they knew it. They would work very hard because they, too, were vested in The Vision—a Five Star Resort. As Bob rode around the grounds in his golf cart, he stopped and spoke to everyone, asked questions about what they were doing, laughed with them, and understood who might need help and saw that they got it. He had heart—with conviction. Marriott’s Rancho Las Palmas Resort did receive a Mobil Travel Guide Fifth Star. Inevitably, Bob Small moved on to become a legendary leader in the hotel industry at Walt Disney World as well as Fairmont Hotels. Reaching success through service isn’t complicated—Bob has given us a pretty clear roadmap. The relentless pursuit of excellence came easy to Bob. He began with people, being present, and having a passion for excellence. He focused on competence –personally, and for those on his team. He knew the importance of vision and heart. He really believed it’s your people who get you there. I think he’s right. What about you? Could you or your organization apply Bob’s philosophy to earn the equivalent of a coveted five-star rating? 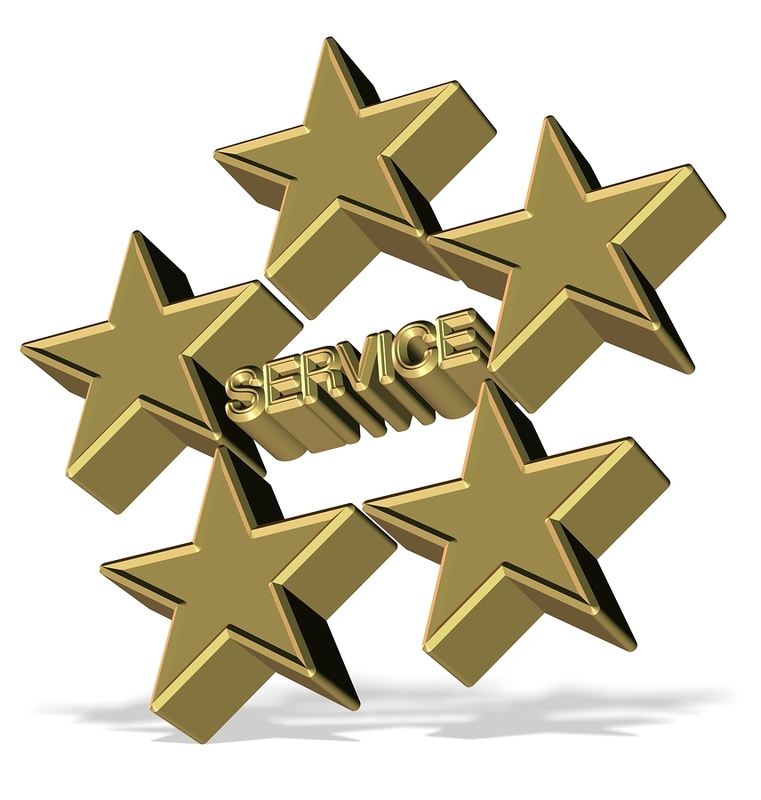 What would a five-star rating look like in your industry? ← Good Plans vs. Good Execution—Which Needs the Most Attention? Love the post, especially the attention to detail and quality that Bob persisted on! Some industry ratings we would not be able to attain, because we don’t want to offer some of those services, but that does not take away from being viewed as 5 star to the guests. awesome! thank you for sharing this. Superb!!!!!!!! article – leading by example, talking to every one, appreciating people for their contribution- very simple way of motivating people. Whether a hotel chain or 3 cabins in the woods, Bob’s philosophy applies to anyone who has a business that services customers. Nice reminders!! What an inspiring article and tribute, Barbara. Thank yor for sharing.